Copy edited items to another location. Delete the folder containing the problem path. 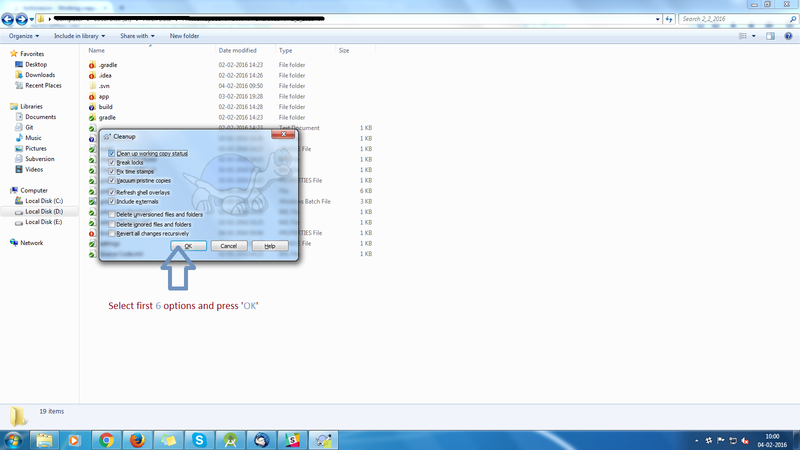 Update the containing folder through Subversion. Copy your files back or merge changes as needed. Another option would be to delete the top level folder and check out again. Hopefully it doesn't come to that though. For me, the trick was to run svn cleanup at the top of my working copy, not in the folder where I'd been working the whole time before the problem occurred. Look in your .svn folder, there will be a file in it called lock. Delete that file and you will be able to update. There may be more lock files in the .svn directory of each subdirectory. They will need deleting also. This could be done as a batch quite simply from the command line with e.g. 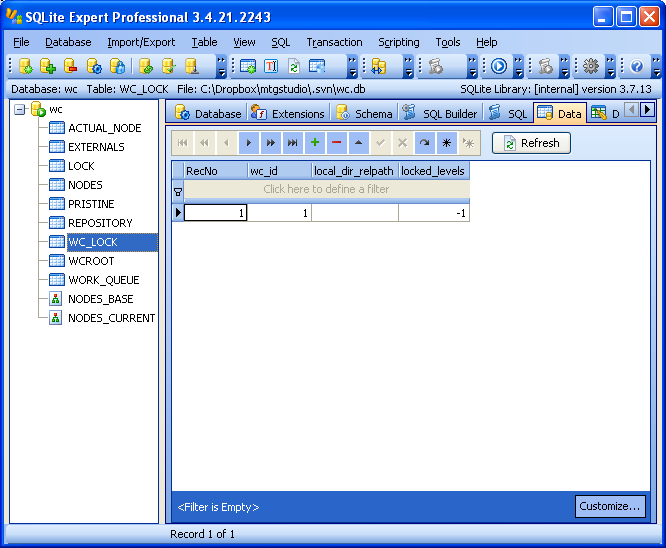 Note that you are manually editing files in the .svn folder. They have been put there for a reason. That reason might be a mistake, but if not you could be damaging your local copy. In my case I solved it by manually deleting a record in the SQLite ".svn\wc" file lock record in the WC_LOCK table. Following eakkas's comment, you might need to delete all the entries from WORK_QUEUE table as well. Go to Parent directory(Folder) of Project. You did your job successfully. Check the screen shots for your reference. A colleague at work constantly sees this message, and for him it's because he deleted a directory under SVN version control without deleting it from SVN, and then created a new directory in its place not under version control, with the same name. There are different ways to fix it, depending on how/why the directory was replaced. B) If you had a significant change of contents in the directory, do an SVN delete on the original, commit, and rename your new directory back to the desired name, followed by an SVN add to get that one under version control. For me none of the above solutions worked. I found a solution by breaking locks. When I performed svn cleanup, I selected "Break Locks" along with "Clean up working copy status". After clean up it will allow you to update to the latest version. For me, it was actually Tortoise's fault, sort of. Tortoise just complained "cannot clean up, run clean up", but when I ran the command line (svn cleanup), it clearly told me that it couldn't delete some files that were in use, the solution to which was obvious. Once I closed Visual Studio (which was keeping the files open), then the cleanup worked fine. Other programs can also keep files open in the repo causing this issue. Excel holding an xls open was a culprit in another instance so it may be wise to close all programs that may be using anything in the repo or even rebooting to force programs to close out and then trying cleanup again. I had this problem because external folders do not want to be linked into an existing folder. If you add an svn:externals property line where the destination is an existing (versioned or non-versioned) folder, you will get the SVN Woring Copy locked error. Here a cleanup will also tell you that everthing is all right but still updating won't work. Solution: Delete the troubling folder from the repository and make an update in the root folder where the svn:externals property is set. This will create the folder and all will be fine again. This problem arose for me because svn:externals for files requires the destination folder to be version controlled. After I noticed that this doesn't work across different repositories, I swaped from external files to external folder and got into this mess. I came across the exact same issue using SVN 1.7 and none of the fixes mentioned above worked. Foremost, make sure you backup all your edited content. After spending a couple of hours (didn't redownload everything as my branch is over 6gb in size), I found that there is a db file called "wc" in the .svn folder of your branch. When i have this problem, i find running the cleanup command directly on the problem path generally seems to work. Then I'll run cleanup from the working root again, and it'll complain about some other directory. and i just repeat until it stops complaining. If you're on a Windows machine, View the repository through a browser and you may well see two files with the same filename but using different cases. Subversion is case sensitive and Windows isn't so you can get a lock when Windows thinks it's pulling down the same file and Subversion doesn't. Delete the duplicate file names on the repository and try again. I did it by just creating a new folder, checking out the project, copying the updated files to the new folder. It was fixed with a fresh checkout. Are you using TortoiseSVN and just upgraded? I've had that problem before when moving from 1.4 to 1.5 and not rebooting. (Try a reboot). The reason you need to reboot is because the cache file gets all funky. Otherwise, to just move on, export that working copy into a new folder (don't copy the .svn hidden folders), re-checkout the project, and move all your code back, then proceed with your commit. just delete the .svn folders, then run a cleanup on the parent directory. Works perfectly!! I often get such an issue. My pattern that causes cleanup problems. I open image file in viewer. Closing image viewer where deleted file is opened solves the problem. Maybe other software can block cleanup the same way. In general. I believe restarting computer may help in such cases. SVN normally updates its internal structure (.svn/prop-base) of the files in a folder before the actual files is fetched from repository. Once the files are fetched this will be cleared up. Frequently the error is thrown because the "update" failed or prematurely cancelled during the update progress. Now the update should work. Do not delete your solution! In-place unversioning of the files, and a fresh checkout into the same location, has solved this problem for me. 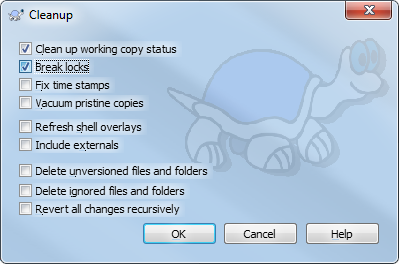 In TortoiseSVN, to do an in-place unversioning, right-drag the root folder of the working copy from the file list onto itself in the directory tree, and choose "SVN Export versioned items here" from the pop-up menu. TortoiseSVN notices that the destination is the same as the source, and suggests unversioning the working copy. After unversioning, do a fresh checkout into the same folder (which now contains an unversioned copy of all the files you had). TortoiseSVN will warn you that you are checking out into an existing folder, but you can go ahead. After this, cleanups, updates and other operations worked without a hitch. Since both of the above steps preserve local modifications, there should not be any loss of information (but backing the working copy up before this may nevertheless be a good idea). One warning: If the working copy contains mixed versions or uncommitted property changes, that information WILL be lost. For me, this is not a common occurrence, and given the choice of a corrupt working copy or losing uncommitted property changes, I tend to opt for the latter. I had this problem where the "clean up" worked, but the "update" would continue to fail. The solution that worked was to delete the folder in question via Windows Explorer, not TortoiseSVN's delete (which marks the deletion as something to commit to the repository, and then I did a "checkout" to essentially "update" the folder from the respository. When you TortoiseSVN → Delete a file, it is removed from your working copy immediately as well as being marked for deletion in the repository on next commit. If a file is deleted via the explorer instead of using the TortoiseSVN context menu, the commit dialog shows those files and lets you remove them from version control too before the commit. However, if you update your working copy, Subversion will spot the missing file and replace it with the latest version from the repository. Then run the cleanup command on that directory, then try to update. Renamed the offending folder by placing an "_" in front of the folder name. Did a "Clean Up" of the parent folder. Renamed the offending folder back to it original name. 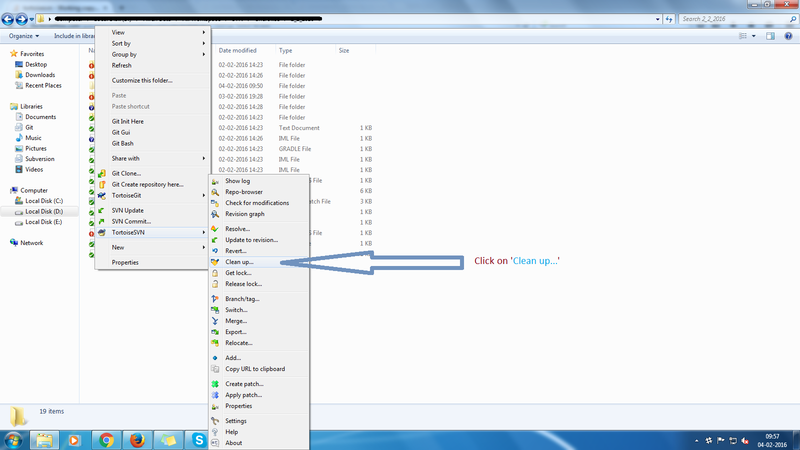 In solution explorer, right click on the project, in the opening sub-menu click on subversion and select clean-up. It will solve the problem, as it did for me. Hope it will work. Do the svncheckout in the root folder. Try performing the clean up operation. This got my issue resolved. For me, the problem was with completely full disk drive (linux inodes in my case), when i deleted some folders it started working again. svn: E155004: Working copy locked; try running 'svn cleanup' on the root of the working copy ('/my/directory') instead. I had this under TortoiseSVN and the error was related to a new directory I'd created under a new project. I had just created this project, so there was no way this directory had existed before. I looked in the repository browser and the new folder was indeed already in the repository, but TortoiseSVN didn't show it as committed. In order to get around it, since I'd just created the folder anyway, I deleted it in the repository, and then did a commit. It worked fine. Since I did this outside of Visual Studio, I then had to restart Visual Studio for it to figure everything out again. Why do I keep getting 'SVN: Working Copy XXXX locked; try performing 'cleanup'?